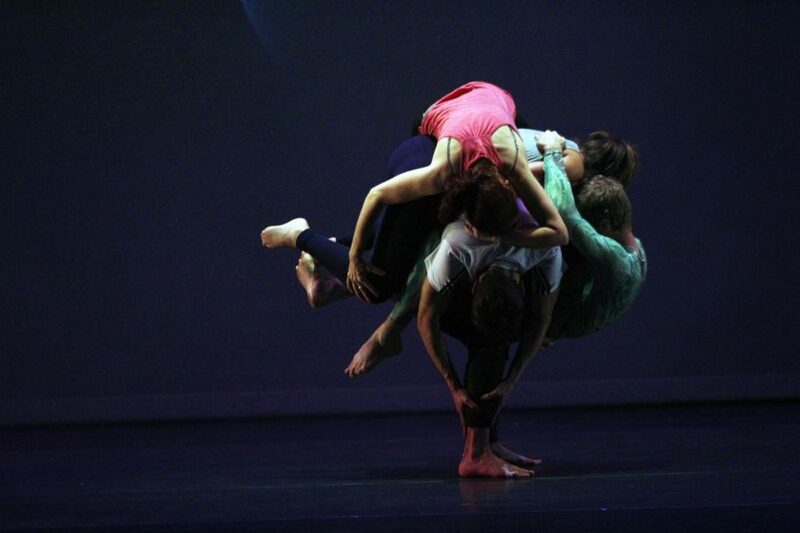 All five members of PUSH [physical theatre] work together to emulate a planet during the piece titled “Galileo.” Using nontraditional partnering techniques, each member of the company relies on the support of co-founder Darren Stevenson, who performed on a broken toe. Defined by athleticism, creativity, and passion, the group, PUSH [physical theatre] opened this year’s Center Stage Series on Saturday, Sept. 8 in the Center for Faith and Life for a crowd of 600 people. The eight pieces that made up this event captured the group’s abilities as acrobats, dancers, and actors through physical storytelling. The traveling team for PUSH is made up of five people: Darren Stevenson, Heather Stevenson, Ashley Jones, Lianne Hart, and Walker Robeson. All five members of PUSH were featured in “The Natural World,” the first piece of the performance. In this piece, each person performed as some sort of bug or animal, which changed as the piece progressed. This piece conveyed a wide range of emotions, such as the silliness of squat-frogs finding order, the aggression of one bug brutally stinging another, and the kindness involved in relieving suffering. While some of the pieces showcased a variety of emotions, others had more focus on specific events and feelings, such as “The Soldier,” a solo piece conceptualized and developed by co-founder of PUSH Darren Stevenson. This shorter piece showed a young man leaving his home to enlist in the military. After saying goodbye to his home and entering the field of battle, the young man began to connect his war-time experiences, like throwing a grenade, to those associated with home, like throwing a baseball. Some of the pieces were created in response to more abstract concepts, such as the final piece of the evening titled “Galileo.” This piece is inspired by Galileo Galilei’s discovery of the heliocentric universe. PUSH presents their own style in this piece through their use of non-traditional partnering. This is a strategy used by the company that involves two or more people working together to use their weight and body to support and balance each other as they perform acrobatic tricks. PUSH was founded in 2000 by Darren and Heather Stevenson. In the 18 years since its founding, PUSH has evolved, welcoming new members to the company. According to Heather Stevenson, each new member of PUSH has influenced the group by bringing their own unique skill set. “While we still have to look like one team and be precise on certain things, on other things [members] can add their own flare to [the choreography],” Heather Stevenson said. 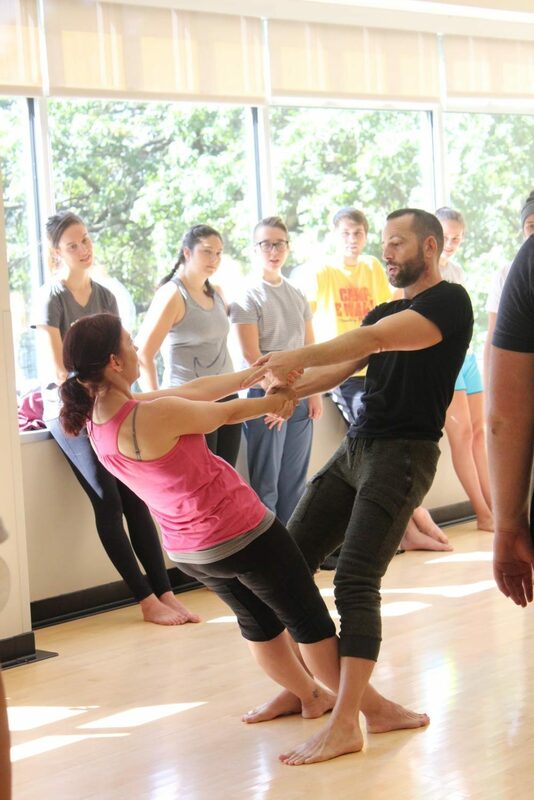 PUSH [physical theatre] co-founders Darren Stevenson and Heather Stevenson explain nontraditional partnering to Luther students. One member of the traveling team that audience members do not see on stage is Toni Elderkin, the lighting designer and technical director for PUSH. Elderkin is a crucial member of the group because the lighting she does helps to develop the stories being told on stage, according to Darren Stevenson. This method of storytelling made Director of Campus Programming Paul Atkins excited to bring them to campus. “They are very creative with their choreography and their use of technology,” Atkins said. The Performing Arts Committee is the student organization that helps to organize the Center Stage Series. President of PAC Alexander Schaeffer (‘20) believes that PUSH’s performance was a strong start to this year’s Center Stage Series. Morgan Fanning (‘20) practices nontraditional partnering with PUSH [physical theatre] member Ashley Jones during the masterclass. The pair works together to practice pouring their weight on their partner who is in table-top position. Audience member Garret Baumler (‘20) enjoyed the wide variety of concepts and emotions showcased in the performance. “They took some very serious topics and conveyed them through a medium that was both captivating and inspiring,” Baumler said. Audience member Mikaela Hanrahan (‘21) appreciated how PUSH’s performance combined many skills into one coherent style. “I think it was really cool how they covered both theatre and dance in their performance,” Hanrahan said. The next event in the Center Stage Series is the Cristina Pato Quartet, which will take place on, Sept. 21 in the CFL. Great Article, Lily Kime. We at PUSH enjoyed our time spent with you. You are an easy person to be around – great interview – put us at ease.